MACWAN, K. R. , PATEL, S. J. Publicly accessible platform for social networking has gained special attraction because of its easy data sharing. Data generated on such social network is analyzed for various activities like marketing, social psychology, etc. This requires preservation of sensitive attributes before it becomes easily accessible. Simply removing the personal identities of the users before publishing data is not enough to maintain the privacy of the individuals. The structure of the social network data itself reveals much information regarding its users and their connections. To resolve this problem, k-degree anonymous method is adopted. It emphasizes on the modification of the graph to provide at least k number of nodes that contain the same degree. However, this approach is not efficient on a huge amount of social data and the modification of the original data fails to maintain data usefulness. In addition to this, the current anonymization approaches focus on a degree sequence-based graph model which leads to major modification of the graph topological properties. In this paper, we have proposed an improved k-degree anonymity model that retain the social network structural properties and also to provide privacy to the individuals. Utility measurement approach for community based graph model is used to verify the performance of the proposed technique. K. Liu and E. Terzi, "Towards identity anonymization on graphs." In Proceedings of the 2008 ACM SIGMOD international conference on Management of data, vol. 10, no. 2, pp. 93-106. ACM, 2008. B. Zhou, J. Pei, and W. Luk, "A brief survey on anonymization techniques for privacy preserving publishing of social network data," ACM Sigkdd Explorations Newsletter, vol. 10, no. 2, pp. 12- 22, 2008. P. Liu and X. Li, "An improved privacy preserving algorithm for publishing social network data," in Proc. 10th Int. Conf. High Perform. Comput. Commun., pp. 888895, 2013. D. Lusseau, "The emergent properties of a dolphin social network." Proceedings of the Royal Society of London B: Biological Sciences, vol. 270, no. 2, 2003. Tian, Yuanyuan, Richard A. Hankins, and Jignesh M. Patel. "Efficient aggregation for graph summarization." In Proceedings of the 2008 ACM SIGMOD international conference on Management of data, vol. 37, no. 2, pp. 567-580. ACM, 2008. Campan A., Truta T.M., "Data and Structural k-Anonymity in Social Networks." In: Bonchi F., Ferrari E., Jiang W., Malin B. (eds) Privacy, Security, and Trust in KDD. Lecture Notes in Computer Science, vol. 545, pp 33-54, . Springer, Berlin, Heidelberg, 2009. Bonchi, F., Gionis, A. and Tassa, T. "Identity obfuscation in graphs through the information theoretic lens." Information Sciences, vol. 275, pp.232-256, 2014. Ying, Xiaowei, and Xintao Wu. "Randomizing social networks: a spectrum preserving approach." In Proceedings of the 2008 SIAM International Conference on Data Mining, Society for Industrial and Applied Mathematics, pp. 739-750, 2008. L. Backstrom, C. Dwork, and J. M. Kleinberg, "Wherefore art thou r3579x? : Anonymized social networks, hidden patterns, and structural steganography," Commun. ACM, vol. 54, no. 12, pp. 133141, 2011. 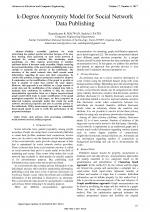 L. Sweeney, "Achieving k-anonymity privacy protection using generalization and suppression," Int. J. Uncertainty Fuzziness Knowl. Based Syst., vol. 10, no. 5, pp. 571588, 2002. Tabales N., Rey J., Carmona F., Caridad Y., "Commercial properties prices appraisal: alternative approach based on neural networks. ", Int. Journal of Artificial Intelligence, vol. 14, no. 1, pp. 53-70, 2016. C. Pozna, N. Minculete, R.-E. Precup, L. T. Koczy, A. Ballagi: "Signatures: Definitions, Operators and Applications to Fuzzy Modeling", Fuzzy Sets and Systems, Vol. 201, pp. 86-104, 2012. Y. Wang, L.Xie, B. Zheng, and K. C. Lee, "High utility k-anonymization for social network publishing", Knowledge and Information Systems, vol. 41, no. 3, pp. 697-725, 2014. Fortunato, S. "Community detection in graphs." Physics reports, vol. 486, no.3-5, pp.75-174, 2010. Shi, J. and Malik, J. "Normalized cuts and image segmentation." IEEE Transactions on pattern analysis and machine intelligence, vol. 22, no. 8, pp. 888-905, 2000. Newman, M.E. and Girvan, M. "Finding and evaluating community structure in networks." Physical review E, vol. 69, no. 2, pp. 026113, 2004. Wong, Raymond Chi-Wing, Ada Wai-Chee Fu, Ke Wang, and Jian Pei. "Minimality attack in privacy preserving data publishing." In Proceedings of the 33rd Int. conference on Very large data bases, vol. 16, no. 4, pp. 543-554, 2007. Maiya, Arun S., and Tanya Y. Berger-Wolf. "Sampling community structure." In Proceedings of the 19th international conference on World wide web, pp. 701-710. ACM, 2010. 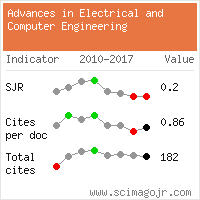 Citations for references updated on 2019-04-18 21:37 in 136 seconds. Website conception, design and maintenance by Eugen COCA. Content updated on 28 Feb 2019. Site engine updated on 28 Feb 2019. This page was generated on the server in 0.058 seconds and loaded in your browser in > seconds.